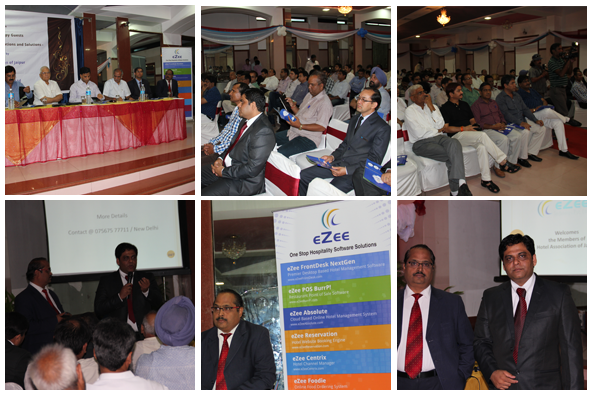 Hotel Association of Jaipur with association with eZee Technosys held Happy Guests Seminar on 10th of August in Jaipur, the capital city of Indian state of Rajasthan. The topic of discussion was Happy Guests – Anticipating Their Expectations and Solutions. The seminar provided a unique opportunity for the members of the association and eZee Technosys to exchange insights into the hospitality trends in the region and the main topic of discussion that was happy guests. Special guest speaker, Dr. Lovkesh Srivastava spoke in great length about the importance of guest satisfaction. Dr. Lovkesh Srivastava, Dean of Cambay Institute of Hospitality Management in Jaipur further elaborated on how customer service excellence can give hotels edge over competition in today's competitive environment. Chief Guest, Mr. Vinod Ajmera who is the Managing Director of Rajasthan Tourism and Development Corporation also spoke briefly about the hospitality industry and showed great support to the hoteliers in the region. CEO of eZee Technosys, Mr. Hitesh Patel, and Senior VP of Sales, Mr. K Radhakrishnan who attended the seminar gave a presentation to the members of the association and guests highlighting eZee's product line up. Emphasizing on strong software ecosystem those eZee products can provide to the hoteliers and improving their operations. The presentation by eZee was well received by the attendees who later engaged directly with eZee in a Q&A session. One of the main topics of discussion during the Q&A session was customer retention and ways how they can successfully take in negative feedback that in some cases does not even make it to the management level. It was a great opportunity for eZee to spend face-to-face time in a relaxed and alternative environment, which was used to cement new and existing relationships. The success of Happy Guests Seminar was in no small part due to active co-operation between Hotel Association of Jaipur and eZee Technosys. The hotel industry is a market driven business and the more you know about your competition, the more edge you gain over them. Rate spider as we call it, will allow you to track on demand rates of your competition in the market. The rate spider dashboard will provide you with direct access to the most relevant information of your direct competitors in the most easy to understand format. You will be able to check the rates that are in direct competition with your hotel, properties which have run out of inventory and which dates are the most competitive. Furthermore, you will be able to set the exact number of properties you would like to track and select the specific properties that are in direct competition with your hotel making the entire process more efficient. With the right information at your fingertips, you will be able to change your pricing strategy according to the market conditions and maximize your profit margins. The Breezes Bali Resort & Spa, a prominent resort in beach town of Seminyak in South Bali, has chosen eZee Technosys as their complete hospitality IT solutions provider. The resort recently implemented eZee FrontDesk as their property management software and eZee BurrP! as their point of sale system for all their restaurants and bars. The resort offers many luxurious facilities such as a tiered lagoon pool that runs the length of the grounds with a white-sand beach on one side and sunken pool bar on the other. Boasting 133 rooms, The Breezes Bali Resort & Spa has the comforts and securities largely in demand by modern travelers. Each of the products is seamlessly integrated with each other providing the resort with a software ecosystem that will cover all the major and minor aspects of the operations. The eZee Malaysia team provided the onsite implementation support and training who will be highlighting the easy to use nature of eZee products and software ecosystem. eZee products and services will provide a strong foundation for the resort's hotel revenue management strategies and enhance performance of their services provided. One of the premium properties in India and part of Carlson Rezidor Hotel Group adapts eZee Centrix as their channel manager. Park Plaza is a contemporary business hotel with 5-star facilities located centrally in the commercial capital of Gujarat, Ahmedabad. 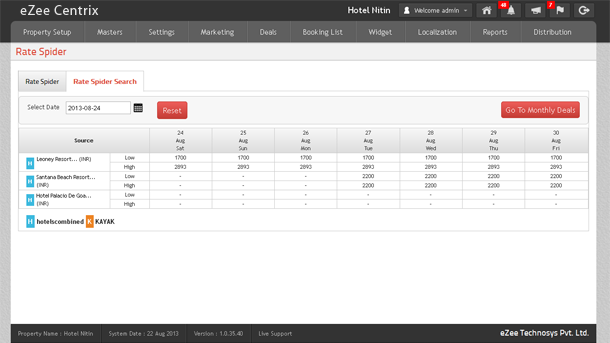 data booked through distribution channels directly to the hotel property management system. The hotel will also process rate and inventory updates through eZee Centrix's XML interface transferring data in real-time helping them control pricing strategies and optimize revenues. Park Plaza Ahmedabad offers 90 guest rooms and suites with amenities designed to provide utmost guest comfort. In addition to modern guest rooms and state-of-the-art meeting facilities, Park Plaza Ahmedabad offers a Business Centre and Fitness Centre, as well as a 24-hour multi-cuisine coffee shop, Gardenia, and fine on-site dining at The Oriental Blossom. Carlson Rezidor Hotel Group being one of the world's largest and most dynamic hotel groups includes more than 1,300 hotels in operations and under development, a global footprint spanning 100 countries. eZee Centrix meets the requirements of IDS/GDS connectivity for Park Plaza Ahmedabad and build a strong relationship for the future. Customers are happy, why should I get a customer feedback system? You may provide the best food and service in the industry or the best amenities at your disposal but the trends or customer expectations are very fragile. What you offer might be enough for your customers to be satisfied but is it really enough for them to keep coming back? For your business to be truly successful and to keep that success constant is matter of adapting the right trends at the right time and keeping up with the ever-changing customer expectations. With a good customer feedback system in place, you will be in constant touch with your customers and evolve naturally in the right direction staying ahead of the competition. How will the feedback system help me differentiate between the feedbacks collected? In order to capture the most accurate feedback timing is one of the most important factors. It is not only about asking the right questions, it is about asking them at the right time without being intrusive. A good feedback system in place can help you with getting in touch with your customers at the right moment. Furthermore, the system should differentiate all the data collected properly and provide the output in form of systematic and intelligent reports. This helps you in detecting the areas of service, which require immediate attention, and you can start taking the appropriate steps right away. In addition, it can greatly help you with improving your staff performance and become an important part of your human resources policy where you can reward staff for their good performance. In can increase your staff morale and make them serve the customers better and overall improving your customer service. Hence, it is very important for your business to choose a feedback system that is capable of breaking down all the data collected in comprehensive form and that can be easily understood and acted upon. What other benefits a feedback system can bring for my business? One of the best things about having a feedback system with robust features is the fact that you can constantly change your feedback style at will. For example, there may be only few areas of your business, which might not live up to the mark when it comes to customer service. Therefore, you can tune the system to collect data only for that particular area that you find worrisome and start working towards improving it right away. As stated before it can be a great tool for your own staff and help you build a stronger team over time. It is an inexpensive way to know your customers, instead of paying a consultancy or someone else to come and tell you to make changes, you can directly keep in regular contact with the source that is your own customer. A good customer feedback system can help you improve your business operations in real time and increase customer retention and loyalty.